This single panel metal door has two separate finishes which makes the detailing more noticeable, despite the subtle contrast of the colors. The door is a darker grey with a brushed finish. The trim work around the door's frame is in two separate pieces, both the contrasting color of dulled silver. The outer trim is a sort of ruffle gathered at regular intervals. 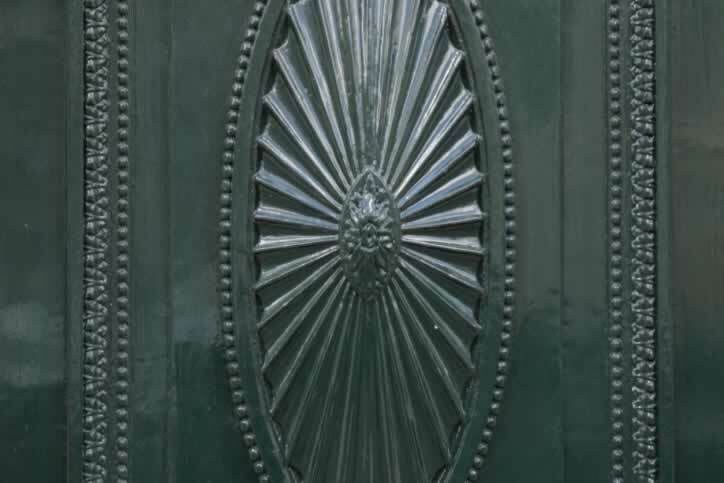 The inner piece of trim is made of adjacent beads of metal that form a string along the door's frame. In the center of the panel, a large oval frame surrounds a large metal ornament, pleated in a star burst pattern. In the center of the ornament is a fully bloomed sunflower. The color and shiny finish of this ornament suggests that with some polish, the metal of the other detail work might shine right up. Metal beads of the same size appear on the outer circumference of the oval frame.